This Fergus Falls, MN hotel and Conference Center is located off of Interstate 94 and Highway 210. This newly remodeled non-smoking facility. The hotel offers a large range of room types from oversized standard rooms to two room suites with whirlpools and a fireplace. In addition, enjoy the large, indoor pool with whirlpool and sauna. Relax with a cup of coffee or hot chocolate next to our fireplace in our cozy lobby. Join us for our guest reception from 5-7 M-Th and enjoy fresh-baked cookies nightly at 8pm. For people that like to stay fit on the road, the hotel offers a wonderful exercise facility. Stay connected to home or the office with our free, hotel-wide, high speed internet. Wake up each morning to our free, hot, home-style AmericInn Perk breakfast with fresh waffles, eggs and breakfast meats, fresh fruit, pastries, coffee, juice and more. You are sure to enjoy this impeccably clean hotel which offers all of the amenities, and friendly staff, expected of a high quality hotel. The AmericInn Fergus Falls hotel is conveniently located in Fergus Falls, Minnesota the gateway to Minnesota Lakes. There are five lakes within city limits and over 1,000 lakes within a one-hour drive. Fergus Falls is distinguished for its historic downtown architecture, tree lined neighborhood streets and plentiful parks. AmericInn of Fergus Falls also is near many area attractions including Red Horse Rand Arena, Prairie Wetlands, A Center for the Arts, and many more. 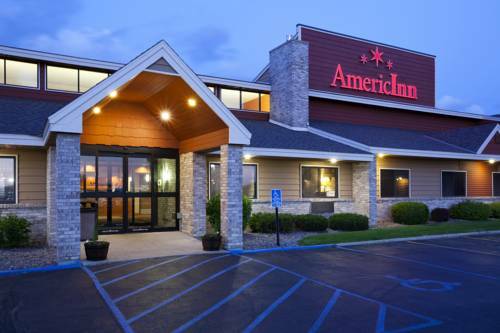 This Fergus Falls MN AmericInn and Conference Center is located off of Interstate 94 and Highway 210 at Exit 54. We are located between Applebees and Burger King. ~23 miles from Fergus Falls.